One day per year, all possible crime (even murder) will be permitted in order to ‘cleanse’ your pent-up frustrations. The movie became a $90 million dollar hit and several sequels and spin-offs have been made. Over in France, a 19-year-old youngster had called via Snapchat to all of his online followers to do the same on Halloween in France. His message caught on like wildfire and several cities saw heavy rioting. The message was discussed so much on social media that 15,000 police were deployed all across France on Wednesday night in anticipation. 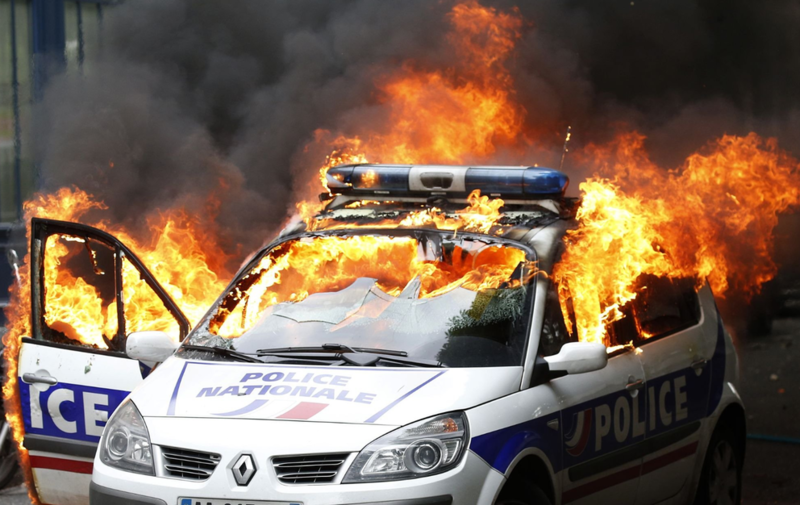 Youths in depressed suburbs of French cities have been torching hundreds of vehicles on New Year’s Eve and Bastille Day since the early 1990s, but now even on Halloween violent rioting was to be seen in Paris and Lyon. The youngster who had called on Snapchat for a “purge” against French police forces was arrested earlier this week. He was released pending trial on November 28. He risks five years imprisonment and €45,000 in fines. Stupid idiot, the police are not the problem. The muslims are the problem, they are destroying our FREEDOM, LIBERTY, and our Western ways of Life. It is time to PURGE THE MUSLIMS from EVERY WESTERN COUNTRY IN THE WORLD! PURGE THE MUSLIMS! NOW. Don't wait until it is too late when the muslims outnumbers you and forces you to convert or die by their swords. Wake up!